If you are cheap thrifty like me, you probably had a heart attack when you heard the price for balloons at Disney. $12+ for the cheapest ones (last time I was there). YIKES! But I must say, I have changed my tune over the years. Now we almost always buy a Disney balloon during our vacation. 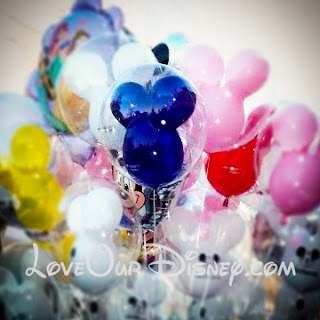 Here are my top 5 reasons to buy a Disney Balloon. They keep kids entertained while waiting for things like parades. They replace them if something goes wrong with your balloon. Not many places will replace your balloon for free if it deflates, etc. But Disney will. It doesn’t matter if it is Day 1 or Day 5, if it deflates or pops during your vacation, simply take it to any balloon vendor and they will replace it for FREE! They are great at identifying your stroller. I thought we had a pretty unique stroller, until we went to Disney… Tying a balloon to your stroller helps it stand out in the stroller parking so you can find yours much easier. It makes it easier to spot others in your party. If it is crowded, and you separate, say to send Dad for fastpasses while you walk around Main Street, Dad can find you a lot easier if he can look for a specific Mickey colored Balloon in the air. They are filled with magic helium. Seriously! If you are able to bring it home, these things will be floating for weeks, maybe even months after your trip. And if you are done with your balloon on the last day of the park, a great way to spread the magic is to find a small child to pass your balloon on to before you leave. It will make their day and you will get to have that warm fuzzy feeling from creating a magical moment for a little kid (and for the parent who now can save $10+ by not having to buy their own balloon). What other reasons would you add to the list of why someone should buy a Disney Balloon? Great list! When I was young, my parents got me a gold Mickey balloon at WDW. After it deflated, they put some ducktape on the back of it and it is now hanging in their basement as a wall decoration. That balloon is probably about 20 years old now, and it still looks great!